The unsuspected victims of Drones. It has been 8 years , 3 month, 1 week and 4 days, it all started from 18th june 2004 when The Government of United States decided to carry out Drone attacks on the basis of War on Terrorism in North and South Waziristan ( Tribal Areas ) which are known as FATA ( Federal Administered Tribal Areas ) of Pakistan, to fight back with Talibans and Al Qaeeda regime which exists in this areas, but nevertheless. These Drones ( Unmanned Ariel Vehicle ) Bomb on pin point locations targets via GPS ( Global Positioning Satellite ) based on local Intelligence ( Waziris ) Local people hired by US which they get paid to place the GPS on the place where Drones will bombs. feed their families the open battle field where aliens Drones fly in and bombs and fly away, The only report which people get is how many militants killed, never reported about how many were injured specially women and children there is no report on any media nor newspaper ever on this. As far I can understand these UAV are bombing and when once a bomb targets blows off the place you don’t know whether house next to it was struck by even a sound wave which is massive, why there hasn’t been any report of Injured people, Specially when the Intelligence is based on the locally hired, This is what Waziris say those who have migrated to various cities in Pakistan even left Pakistan forever, That Tribal people are using US Drones for their personal mean, mostly for their enemies not the militants they Place the GPS to their enemy’s place it is smaller as ( SIM ) ( Mobile GSM Sim Card ) where easy to place it dig the ground or just throw it, rest Drones fly above detects the GPS and Bomb that place. 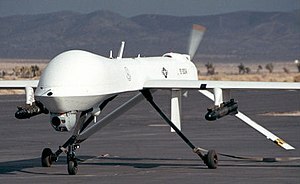 FATA has become playground for Drones to attack in the name of War on Terrorism, If there are so many Militants ( Taliban and Al Qaeeda ) than why don’t Pakistan Army and US Marines both jointly do the operation on the ground, meanwhile Pakistan Arm Forces are on the ground, I am wondering what for to see how many more are going to die this time when Bomb will strike, I cannot imagine on one hand world enjoying Olympics 2012 London and on the other hand Waziristan my mind doesn’t accept this reality that how can the Intelligence could be so weak, Drones are not Invisible if the militants had them in their sight they could have fired back and yes US has lost quiet a few Drones like this too. What is the solution of this never-ending War on Terrorism, after bombing entire Waziristan United States will achieve its goal, End the Terrorism from the world. Seriously that’s non sense. What was required the ground operation, Pakistan Army did that back in 2008 and before, which was successful by all means and the best thing about it was they moved the local people from that area first than started off the mission so that no innocent dies, later when the operation was over Pakistan Army re-settled the people helped them to make their homes and continue with their lives. United States been carrying operations in Afghanistan when they cannot control the entire Afghanistan they start blaming Pakistan and Attacking FATA. The outcome of it is, Pakistani people die, more than 37,000 lives are lost due to this War on Terror this is official figure, where as I doubt unofficial must be double of it, killing innocent in the name of War on Terror Anti-Jihad Movement to restore peace how many more? Franky Speaking these figures are not even close to as many times I have heard on the news since 2004 , atleast twice a week which means over 100 strikes a year , 8 and a half years = 346 , Wow I am surprised………. Post effects of the drone attacks on Pakistani cities, all major cities had suicide bombings in which Karachi , Lahore, Quetta , Peshawar and The Capital of Pakistan Islamabad are on top. People has suffered and witnessed brutal after math effects, yet they hasn’t ended. Pakistani Government and United States had the conflict on Slala Check Post Attack which killed Pakistani Soldiers on duty ( Pak – Afghan ) Border bombed by United States, in return first it was said ( GPS Mistake ) Mis-located was it an X-ray that you saw invert and Yes Bomb here ! anyways later after 9 and a half months apology came out of State Department, since they were having hard time to supply from North Route, NATO Supplies restored and just on the next friday Drone Attack killed 13 next day 18, Death toll kept rolling, No Word from Pakistani Officials ( Government nor Army ) even Mr. Notice ( Chief Justice Of Pakistan ) been silent on this issue till dated. Neither Peace can ever be achieved by bombing nor US-AID, United States Citizens Tax payers money being used to Educate the People of Pakistan ( FATA ) is useful, all waste and useless just to show See we are helping you on the other hand there’s a track ( Born to be wild ) . Shared Intelligence has always failed when ever CIA and ISI worked jointly, there is no such thing as trust in between agencies, X files mostly get shared meanwhile the actual cards never been shown, to what extend this had to go and carry on, I am asking all the people of the world, is it the war against Militants ( Talibans or Al Qaeeda ) which are now recruited and trained again by US Forces as Afghan Police, How great is it, Training my own enemy handing him a gun and a badge now you serve the country after I’ll leave, you know what he must be saying, idiot i was doing the same thing without a badge now I have New weapon and I am even getting paid for it. No matter what people of the world think or say about this but eventually Afghanistan will be back in Talibans control face the reality and the facts, There are such places in Afghanistan where US Forces don’t even exist and Talibans hold the Control, just because cannot eliminate them, Let’s Bomb Waziristan use Drones for it. I see no Humanity in Humans anymore, War has been going on more than 10 years longest war in the history of the world and nothing gained out of it. None in the history conquered and ruled Afghanistan not even Afghanis themselves, this land has always been Battle field since ancient civilization. Are we trying to achieve peace or prefer the destruction, this choice isn’t in the hands of Waziristan ( FATA) Pakistan, just imagine 37,000 Pakistanis all around Pakistan been a victim of this War. How many US Soldiers has died what for? Let’s Say No to War, it’s not the solution to achieve peace 10 years non stop, this time either US & Pak Army decides to do ground operation on full-scale or Stop using local Waziris as their spy agents on the ground that’s so foolish of CIA cannot imagine what has gone with their brain, totally senseless hiring local agents untrained and unaware of War Tactics, majority of the people are unsuspected victims of Brutality. STOP DRONE ATTACKS ! Since November after attack of Salala army check post on the border by Nato forces, Pakistan has stopped NATO supplies from its ground routes, If Chicago summit Obama administration expecting from President Asif Ali Zardari will negotiate and resume the supplies from Pakistan to Afghanistan but, President Zardari stood on his point that United States should apologize for Salala air strike which killed Pakistani troops. United States’s delegation came to Pakistan to sort out Nato supplies issue yesterday Pentagon called the delegation back from Pakistan, in fact what’s strange is Chief Of Army Staff Gen.Kayani refused to meet. NATO Supplies are resumed from upper countries like Turkmenistan, Uzbekistan and Kazakhstan. United States and Pakistan’s relations has reached on a point of no return, as Chief of Army Staff Pakistan Gen.Kiyani refuse to meet delegation and pentagon called them back, Still the easiest route for the supplies is Pakistan for keeping War on Terror, yet United States is seeking to unseal the borders of Pakistan for the supplies. As a citizen of Pakistan it is my right to ask what’s foriegn policy and strategy on NATO supplies, since now people are well aware of what’s happening and discussing each matter on media channels as well as Facebook / Twitter social sites. I asked Foreign Minister of Pakistan Hina Rubanni khar since she was on twitter, I asked her ” Why Gen.Kiyani didn’t meet US delegation, why suicide bombing in Near by Cities of Pakistan which are closer to Afghanistan, suicide bombing has again started, when you know it’s not only Tehreeh-e-Taliban Pakistan but other countries are involved? first she didn’t replied me, later when she did her answer was ” Don’t try to trapgate me, Mister “. I wasn’t trying to trapgate her at all, in fact I was trying to know as a citizen it is my right to ask, what’s the relation in suicide bombing and NATO Supplies, on while Gen.Kiyani didn’t meet US delegation, pentagon called them back. My point is based on my perception that TTP is not the only one involved in suicide bombing in Pakistan, Border between Afghanistan and Pakistan is largely open for anyone to cross due to it’s difficult geographic location terrain, the involvement of Indian and Israeli agencies send their trainers to train people, if you are wondering how? than it’s very easy, Fly from Delhi to Kabul rest by road till border and cross the border enter inside Pakistan stay as long as you want in Tribal area or Baluchistan at some extend Baluchistan is already victim of Pakistan Army and Inter service Intelligence ISI Pakistani intelligence been very brutal with Nationalists by kidnapping and torture killing them for no fair reason, since the situation is like this than the border with Baluchistan is way too long with Afghanistan from where intervention is very easy, this insurgency, bombing, terror, violence in Pakistan. Government Officials are answerable for these questions, to the people of Pakistan. while FM felt I am trying to TRAPGATE HER? let’s say even the way i think it is not like this than why suicide attacks always start when supplies gets resumed now daily there is a suicide or timer bomb blast which shows openly that there is a lack of security and foreign policy is not being follow. As a country Pakistan has a right to agree and resume or step out of this unstoppable war. People of Pakistan are being victim by saying NO TO SUPPLIES ! Entering inside Pakistan is easy, when trainers are backed by United States and NATO, Think again, why would insurgency terrorism in Pakistan has disturbed normal life. More than 35,000 has died till dated, these are official figures, US drone attacks still continues, which isn’t bring any good results at all, every time they claim to strike terrorist but so many innocent people loose their lives, Pakistan Army is not taking any action because it has left this matter in the hands of Diplomatic Channel between United States and Pakistani Government, where as Pakistani Parliament has passed resolution couple of months, due to which Drone Attacks were stopped for sometime, But United States is de-stablizing My country and making situation more worst, People Hate America here just because of their unlawful acts all thou I know American People got nothing to do with what Army does but it is degrading their image as biggest terrorist. Pakistan Army is already doing the operation in those areas where Taliban and other extremist which cross over Afghanistan-Pakistan border. United States Army knows that Pakistan Army is capable of handling the situation in their territory than they should share the intelligence information ( CIA / ISI ) instead of Drone Attacks. United States Army is responsible of 35,000 innocent lives died due to their injustice. This is unlawful, against humanity, prosperity and sovereignty. As a citizen of Pakistan, I request you all to sign this petition and show that you are against such acts. The Siachen Glacier is located in the eastern Karakoram range in the Himalaya Mountains at about 35.5°N 77.0°E, just east of the Line of Control between India-Pakistan. India controls all of the Siachen Glacier itself, including all tributary glaciers. At 70 km (43 mi) long, it is the longest glacier in the Karakoram and second-longest in the world’s non-polar areas. It falls from an altitude of 5,753 m (18,875 ft) above sea level at its head at Indira Col on the China border down to 3,620 m (11,875 ft) at its terminus. The Siachen Conflict, sometimes referred to as the Siachen War, is a military conflict between India and Pakistan over the disputed Siachen Glacier region in Kashmir. A cease-fire went into effect in 2003. The conflict began in 1984 with India’s successful Operation Meghdoot during which it wrested control of the Siachen Glacier from Pakistan and forced the Pakistanis to retreat west of the Saltoro Ridge. India has established control over all of the 70 kilometres (43 mi) long Siachen Glacier and all of its tributary glaciers, as well as the three main passes of the Saltoro Ridge immediately west of the glacier—Sia La, Bilafond La, and Gyong La. Pakistan controls the glacial valleys immediately west of the Saltoro Ridge. According to TIME magazine, India gained more than 1,000 square miles (3,000 km2) of territory because of its military operations in Siachen. ? In 1957 Pakistan permitted a British expedition under Eric Shipton to approach the Siachen through the Bilafond La, and recce Saltoro Kangri. Five years later a Japanese-Pakistani expedition put two Japanese and a Pakistani Army climber on top of Saltoro Kangri. These were early moves in this particular game of oropolitics. The United States Defense Mapping Agency (now National Geospatial-Intelligence Agency) began in about 1967 to show, with no legal or historical justification or any boundary documentation, an international boundary on their Tactical Pilotage Charts available to the public and pilots as proceeding from NJ9842 east-northeast to the Karakoram Pass at 5,534 m (18,136 ft) on the China border. Numerous governmental and private cartographers and atlas producers followed suit. This resulted in the US cartographically “awarding” the entire 5,000 square kilometers (1,900 sq mi) of the Siachen-Saltoro area to Pakistan. I been little confused about it that’s why sharing with you all, it is divided in between Pakistan , China and India but the Army Base Camp which is one of the highest in the world is Pakistan’s not indian. Still I ask the visitors , Who holds the control of the third pole ? It’s the daily news, Pakistan Army and Paramilitary forces are fighting against militants in North Waziristan. Tribal area just yesterday before Head of state department Hillary Clinton was expected to arrive Islamabad, 34 Taliban Militants were killed by paramilitary forces of Pakistan, means Pakistan with or without United states help, continuing the operation against militancy. Thanks for People of those area for being supportive to stop and cut off this surge which has been cause of death and devastation in pakistan and constantly fighting Pakistan Army along with Paramilitary forces, breaking the back bone of extremists. As being a Pakistani, I can assure to everyone that, No Pakistani like me is in favor of Talibans and Extremists because we have seen and been the victim of it, time after time now that suicide bombing and militants activities are narrowed we all are focusing on development and infrastructure, I am not in favor of war at all, even when it comes to India, we can have table talks, instead of repeating the history. I think this question is a question of every Pakistani and those who are in favor of peace instead of War, since War on Terror Pakistan has began, Pakistan been the 1# victim of it which official states that it has lost above 5000 troops, security personal and high-ranking officers in previous ten years and more than 30,000 innocent Pakistani‘s been the target of ( Taliban forces , Drone Attacks and other conflicts ) with over 35,000 innocent people have lost their lives in Pakistan is still against and there was a time Pakistan was loosing it’s state of swat which was almost in control of Taliban but Pak Army took over with in 2 months life was normal there but what happened in 2 months, the echos of the blasts still left the marks there. Now Pakistan is not having any army operation with in Pakistan but agencies ( Tribal Areas ) which are under Federally Administered. It is a very interesting question why Pakistan is being target and to de-stabilize it since decades external forces are doing such things which never been in good favor of Pakistan, even some people think Pakistani’s are like Taliban and supporter of terrorism, those who been a victim of it, I wonder how could possible be anyone in this world think that every mother in Pakistan is giving birth to a terrorist, as a Muslim, one Pakistani is a brother of another, would anyone kill his brother for the sake of showing he is better muslim? Does Islam allow killing innocents, the answer is NO. Like any other religion Islam gives the message of Peace and Prosperity in which protection , care , helping mankind , being good with others and respect their faith. What world experienced that Taliban’s are true muslim and rest of the world muslims are also one of them, on this I wanted to testify that we muslims don’t consider any killer , murderer as muslim or worshipper of Almighty Allah. i ) Pakistan has over 1,000 Uranium favorable sites up till now 12% have been explored, “More than 65& of the favourable sites have been scanned through airborne gamma-spectrometric and foot radiometry surveys for its potential, while 35 per cent is yet to be checked”, In entire world known as Yellow Cake, It may sound that it is nothing but Nigeria had Uranium it would have been the one of the richest countries, since it has something which keeps Nuclear reacting, the fuel for it, but instead of it, civil war, tribal war, economically devastation and now hand to mouth hardly, It was claimed that Nigeria transported 5000 tons of Uranium to Iraq which became the reason, that Iraq has Weapons of Mass Destruction which you all must have seen on your TV specially Former President Bush knows where exactly they are were, Not a single one they found and they bombed , killed innocent civilians and Today’s Iraqi‘s cursing american’s and american don’t even know why they went for War with Iraq, but look at the economical condition of the country which sold 5000 tons I don’t think it can be less than billions of dollars where did the money go, the answer is, it never came, it never was, this deal never took place, When United State found out Nigeria has uranium, US took it for their research and development and collapsed the country filling with hunger , riots , civil war behind. Why am I telling you all this, because Since Bush Junior, and President Obama took oath, it is being advised to create same situation in pakistan, which every Pakistani is aware of, The tactics of United States,If Pakistan Asia’s largest reserve and world’s 2nd after Nigeria, Africa, and Pakistan’s Atomic Energy commission has claimed that over 1000 sites, It means Pakistan has enough to extend its powers. It is something which belongs to Pakistan and every Pakistani hardly 5% people knows that Pakistan have all this. ii ) The Geographic location of Pakistan is very precious because It connects China with Middle East and so on entire Europe, not only this but But Pakistan also can link not only india with europe but Afghanistan and russia as well, which means the Geo location of the Pakistan stands on the tip or the most wanted country for trade and business linking the world, if you people are aware of International Highway will cross Pakistan which is going to link Moscow with Shanghai, the very old Silk Road known as Karakoram highway one of the highest highways is again gains the importance of being the part of International Highway and when Gawadar port, Pakistan, will be linked via train route with Iran, Not only Pakistan but even China will use it as Hub for the trade business with europe. EU , Russia , China , Turkey , Iran along with Pakistan are working on a plan which is going to be the world’s longest highway, linking South Asia , with Middle East , Europe and Africa which is valuable for all the countries not only Russia Turkey,Iran , Pakistan, Afghanistan and China. iii ) Pakistan’s assets reserves are in top 10 in the world like Salt , Coal , Uranium , Marble , Cotton , Gas , Crude Oil , Gold and list goes on. People always ask me, why foreign companies are not investing in Pakistan, to them I would say don’t see what you only see on the screen, visit Pakistan and visit these remote areas to know who is working there and why, I don’t think Chinese government has gone crazy by investing Billions to boost its business, seeing is not believing, this is not our Faith because we believe and have faith in the unseen God. Rules are made by people, Media shows nothing positive about Pakistan and God Bless Pakistan, We have enough to not only stand but be the supports of weaker nations, to protect, to feed, to share a smile with the world, after these thousands of sacrifices one can imagine how strong Pakistani’s are. These Taliban and Al Qaeeda etc… I seriously don’t get do you really people believe in this non sense, If they had controlled over Iraq or Afghanistan, What United States don’t have technology, Intelligence? you sure about that ? well think again, who is funding Terrorist? People says Saudi’s and sheikhs well dear, even sheikhs will become beggars as they continually been fighting since 10 years and their network is world-wide. by the way who provides the security to Saudi’s and Sheikhs ? ………. ! There you got the answer. It’s never was about peace or you and me dear. Here we all are being Internationally terrorized, In front we see the face of Islam and Muslims are the terrorist, they kill cause it’s legal in their religion, this is result of little knowledge of people and being narrow minded, at least I have courage to deal with such people and I thank God that I am proud to be Pakistan and I know my Land well, where it has so many wrongs and it also has rights but when it comes to know ( United States is Against Pakistan ) forcing them to seek and destroy the safe heavens of Taliban networks? Else United States will send troops inside Pakistan to destroy them in which they could stand against Pak Army. Safe Heavens ? Taliban ? who created ? who funds them ? who protects them ? more than million bomb I think been thrown on targets still not able to kill, capture and destroyed all? what is it a joke or a movie! Please People of the world from all the nations want peace and we Pakistani’s are one of them. NO TO WAR !